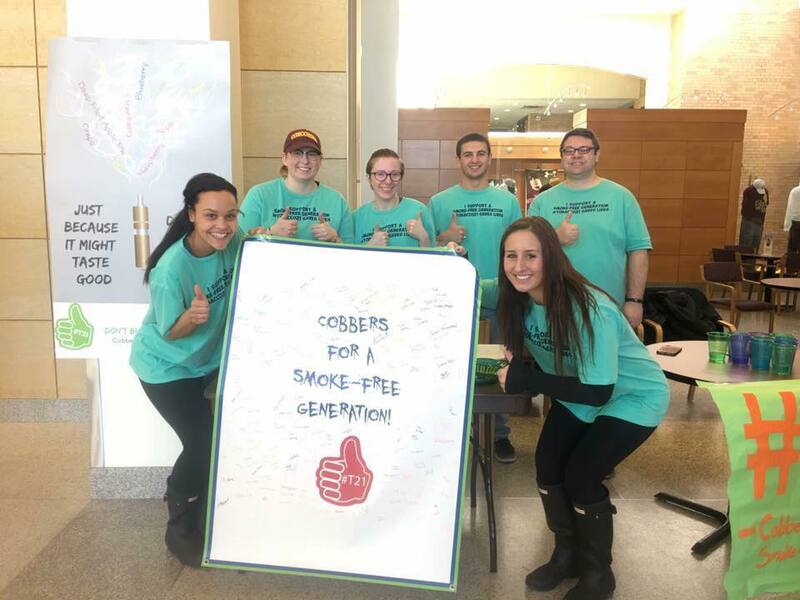 Students in Dr. Cindy Larson-Casselton’s Health Communications course tabled in the Atrium last week to gain support for raising the legal age for purchasing tobacco products to 21. Photo courtesy of Sarah Strand. Dr. Cindy Larson-Casselton, chair and professor of communication studies at Concordia, is surprised by the development of rules and legislation in regards to tobacco she has seen over her lifetime. “If you were to tell me restaurants would be smoke-free, bowling alleys would be smoke-free, whole campuses were smoke-free, I would have told you, ‘You’re crazy,’” she said. Even at Concordia, it used to be common to light up indoors; Larson-Casselton recalls her advisor smoking in his office back when she was a student. But times have changed in the United States, with medical research on the dangers of smoking leading to bans on smoking indoors, in public places, in schools, and on airplanes over the past few decades. At Concordia, a smoke-free policy went into effect Aug. 2014. Advancements in technology are once again changing the conversation about smoking. With e-cigarettes gaining traction across the country, so is the campaign to raise the purchase age for tobacco products, including e-cigarettes, to 21 years old. Known as Tobacco 21, or T21, this national campaign is the work of the Preventing Tobacco Addiction Foundation. The local contingent is sponsored by Partnership for Health, who have spent the past semester working with students in Larson-Casselton’s Health Communications Capstone course. The course requires groups of students to develop health advocacy projects over the span of the semester. While Larson-Casselton teaches in the communication studies department at Concordia, she explains that the interdisciplinary Capstone course is beneficial for students in all majors. “The beauty of the course is it does bring in multiple disciplines to study this. I have bio majors and chemistry majors, and psychology majors and healthcare business majors. They each bring a unique skill set and work together to work on the project,” Larson-Casselton said. 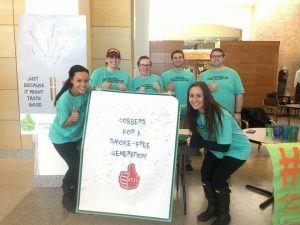 While the course consists of five different projects not all focused on raising the smoking age, the group working on T21 has been particularly visible on campus. Hunter Smith, Sarah Strand, Rebecca Ekert, Tiana Brown, and Brooke Simonson tabled in the Atrium last Friday, April 6, to build awareness and collect petition signatures. Simonson, a senior biology major, took interest in the new ways that the younger generation is getting their nicotine fix. “The spin we took with it this year was the JUULs [a popular e-cigarette brand], that’s what big right now,” said Simonson. E-cigarettes work by heating up a liquid, usually a mixture of some nicotine, chemicals to vaporize the nicotine, and flavoring, which is vaporized and then inhaled by the smoker. The innocent look to e-cigarettes is what Simonson believes allows younger, more vulnerable people to get hooked on tobacco products in this day and age. Their advocacy work hopes to get college-age students and others to notice the greater harm in e-cigarettes. Kristen Nosal, a junior global studies major, agrees with the work being done by the T21 group. Nosal grew up around cigarette smoking in the home and struggled with cigarette addiction herself for four years before quitting when she was 18 years old. Nosal noted that culture had a strong influence on her usage.